Today we have guest posts from Alex and Laura. Shalom from Ashkelon, Israel! My name is Laura and I’m a rising sophomore at Harvard University. I haven’t decided what I’m going to major in and ventured here this summer in hope that getting some field experience would help me decide. I’ve always been fasciated by archeology and ancient civilizations and upon discovering this program, I knew I wanted to come. As with many of the other volunteers who have posted on this blog, I didn’t really have a clue what I was getting myself into. I thought small tools like dentists’ picks would be involved and we’d be finding fabulously glamorous relics and entire vessels. Little did I know I’d actually have calluses from pick axing by the end of the first week. And that I’d absolutely love it. These past six weeks have brought me a greater appreciation of the field of archeology, the excavation process, and all the sweat that’s involved. I was placed in Grid 44, this season’s new excavation area, so I’ve been able to see the process from the very beginning. The first two weeks we pick axed our way through so much dirt, it seemed like we would never get to any architecture. But patience and optimism are a huge part of the field I’ve discovered. Our patience has paid off and this season we’ve made some incredible finds on the tell, such as a mosaic floor, some dog burials, a jasper scarab bead, and a series of drains that make up a larger water system. It’s also the small finds that, while they don’t seem as glamorous, are highly significant in shaping the greater picture of what life was like for people who inhabited the space hundreds, even thousands of years ago. A single shard of pottery can date the construction of a wall and completely change the interpretation of a building. It’s actually happened in our grid a few times. This season has been incredible and while I haven’t definitively decided on archeology as a major, I’ve definitely enjoyed my time spent here. I’ve become so invested and attached to my grid. I’ve come to love sweeping it and defining the architecture, even feeling wiped at the end of the day only to wake up at four thirty to do it all over again the next day. So I guess this summer wasn’t exactly what I thought it would be, I didn’t see a single dentists’ pick all summer and most days I’d reach up to rub sweat from my face only to smear it with a layer of dirt. But despite these things, and maybe even because of them, it was so much better than anything I could have expected and I’ve loved every second. Hello. My name is Alexandra. I am a second year graduate student studying under the tutelage of Dr. Heather Walsh-Haney at Florida Gulf Coast University. I am working towards obtaining a Masters in Criminal Forensic Studies with a concentration in Human Identification and Trauma Analysis. 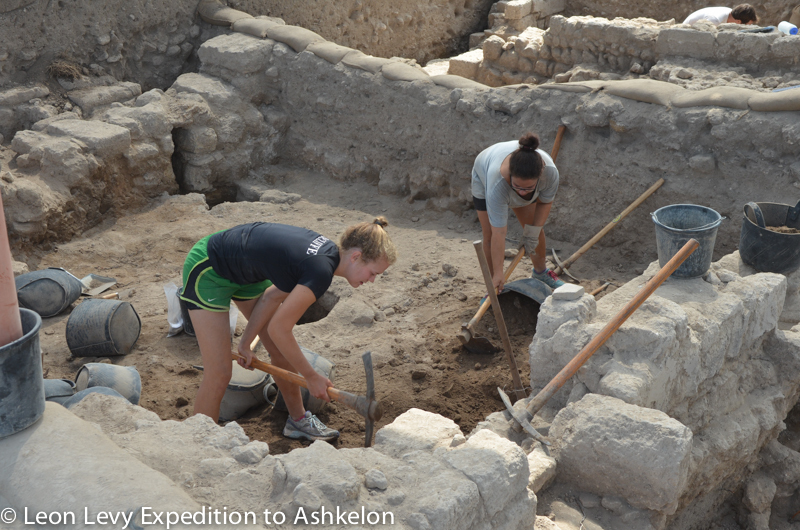 I came to Ashkelon with little archaeological experience outside of a few classes I took throughout my academic career, but I had not yet experienced something to this magnitude. I did not know what to expect upon arrival. I came here thinking this would be a little bit more similar to the tourist Dig for a Day activity I participated in at other sites. Boy, was I wrong! By the end of day one working in Grid 51, I was completely worn out and the sweatiest I have ever been. The following day, tired and sore, I went over to Grid 44. We had to wait until they finished digging with the backhoe before we could start working in our assigned area. From there, we hit the ground running and haven't looked back! Architecture has been popping up since our first week in the grid. Five and a half weeks later, we have uncovered a mosaic floor, a vat that has possibly been used for wine production, complete oil lamps, bone dolls made from animal bones, and many drains. All of these drains in conjunction with the amount of ceramic slag and burnt pottery we have uncovered is painting a picture of our area being the location of an Islamic workshop area that was producing worked bone and ceramics. We may even have a kiln located in the area outside of our 10mx10m grid! Hopefully we will be able to expand this area next season. Over the past five and a half weeks, not only have a made new friends and learned about archaeological methods, but I have put them into practice and gained respect for those who currently have and are pursuing archeology as a career. Field archeology is hard work! It is physically strenuous and involves extreme dedication and precision in some areas, but the hard manual labor makes the joys of uncovering artifacts even more rewarding. I have caught archeology fever! I am now looking for ways to tweek my current study to focus more on an archaeological aspect the to the forensic anthropology world. I will be back here next season! It is a wonderful feeling to experience something and realize it is about to change your entire world. I can truly see myself working in this field. Who doesn't want to have a little fun and get a little dirty for part of a career! ?